Online tools are constantly evolving, improving how they provide service and PDF to JPG online converters are no different. While each seeks to provide the easiest way to convert PDF to JPG online for free, not all succeed at this venture. What is true is, when looking for a PDF to JPG converter online, you will find a lot of options to choose from. The one you choose will depend on your specific needs, but the following are just some of the best we've found based on performance, rating and efficiency. While the site may appear cluttered an unappealing, My-Addr.com can also be a great PDF to JPG converter especially when you just need to convert a single file, really quickly. MinyPDF is an online tool that can be used to convert PDF files to multiple formats including JPG. It is widely available and easy to use. If what you are looking for is a very simple free online PDF to JPG converter, then PDFtoJPG.me is the best tool to choose. It is primarily ideal for those who want to simply convert a single file or a small number of files. The interface is self-explanatory although it does let you set the page range to be converted and the output quality of the resultant JPG file. 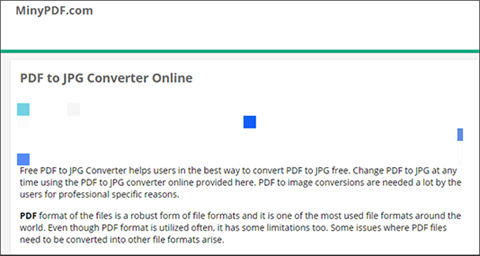 PDF2JPG is another simple PDF to JPG converter online free tool that provides the opportunity to convert a PDF document to JPG format quickly and easily. With this one, you can also set the output format. The converted images can then be downloaded as a ZIP file. One of the most popular online PDF to JPG converter free tools, SmallPDF comes with a lot of tool to manage and convert PDF documents. One of them is the PDF to JPG conversion tool. It is completely free to use and is one of the most effective converters in terms of efficiency. PDF to Image is the tool to choose if you have a lot of files to convert PDF to JPG online fast for the simple reason that it makes uploading multiple PDFs into the tool so much easier. In fact, all you have to do is drag and drop the files into the program to begin conversion. Zamzar is another online tool that provides you with multiple tools to convert PDF to numerous other formats including JPG. The process of conversion as it is on most online tools is quick and easy. 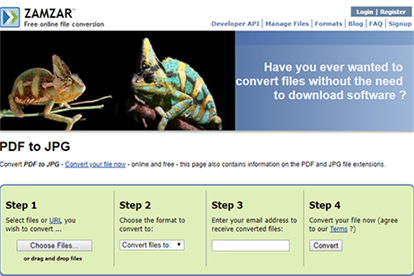 Convert Online Free is another complete online tool that can be used to convert a PDF to any format including JPG. It supports different resolutions and the conversion process begins as soon as you upload the file. 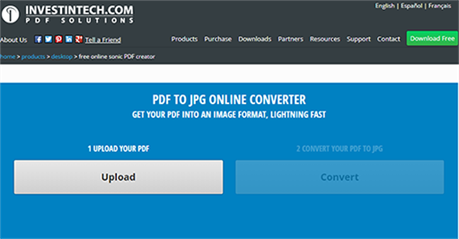 Convert My Imag is another online tool that can prove useful when converting PDF to JPG. It is ideal for the conversion of batch documents and may even help you with light image editing. As the name suggests, Online2PDF is an online tool that primarily converts other file formats to PDF. But it can also be used to convert PDF to other formats including JPG. It is very easy to use and even comes with simple PDF editing features such as the ability to merge a PDF. iLovePDF is an online PDF to JPG converter understands that you don't have a lot of time and therefore has created an interface that very simple and uncluttered. You simply select the PDF and the conversion process begins immediately. Docs.zone presents a simple user interface designed to help you easily convert your PDF to JPG. It also has a wide range of other solutions to choose from, even allowing users to easily combine multiple PDFs into one. Investintech PDF Solutions offers a free and easy way to convert PDF files to JPG. It is easy to use; all you have to do is upload the file and then click on the "Convert" button. But it lacks other PDF management solutions such as the ability to convert PDF to other formats or edit PDF documents. Free PDF Converter is one of the most popular online PDF converters mostly because it can convert PDFs to just about any format including JPG. It is also very easy to use although you may find yourself having to create an account and sign in if you are going to access some of it more advanced features. PDFCandy is a great tool to use when you're in a rush since its interface is easy to use and uncluttered. Also once you upload the PDF you want to convert, the conversion process begins immediately. 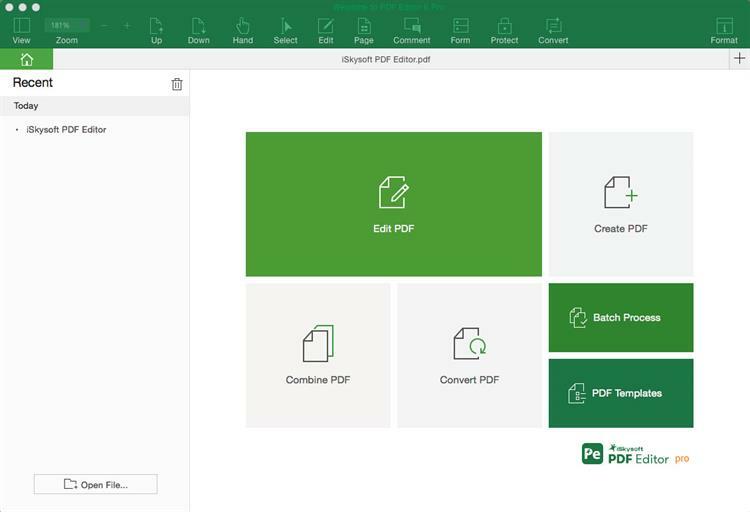 If you want to convert PDF to JPG in high quality with ease, iSkysoft PDF Editor 6 Professional for Mac (or iSkysoft PDF Editor 6 Professional for Windows) will be your best choice. 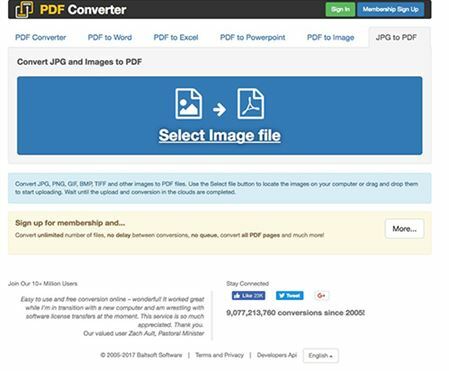 This PDF converter provides you a free trial version; you can download and use this PDF tool to convert PDF to JPG free of cost. You can also use this tool to edit PDF files with multiple PDF editing tools. Follow the 3 simple steps below to convert PDF to JPG in high quality easily. Step 1. 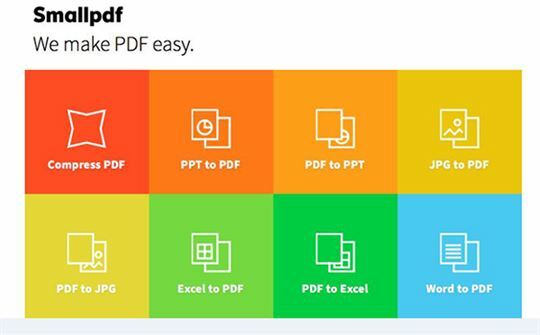 Download and install iSkysoft PDF Editor 6 Professional on your Mac. Step 2. Drag and drop your PDF file to "Convert PDF" tab on the main interface. Step 3. Choose the "To Image" option under "Convert" menu and change the image quality on the right side toolbar. While all of these free PDF to JPG online converters may be ideal when you need a quick solution, most will not produce a quality output image and many will not even allow you to set the resolution or color of the output image. If you are looking for more control, iSkysoft PDF Editor 6 Professional for Mac (or iSkysoft PDF Editor 6 Professional for Windows) may be the only tool that can provide you with the necessary features to manage your PDF document and when you need to, convert it into a quality JPG file. The following are some of the features that make iSkysoft PDF Editor the best choice. You can use it to convert any number of PDF documents to JPG or any other format. It can also be used to easily edit the content on a PDF document. It has powerful OCR features for editing a scanned PDF and annotation features for easy PDF reading. It also allows you to easily share the PDF document after conversion either via email or cloud storage services like Google Drive and Dropbox. 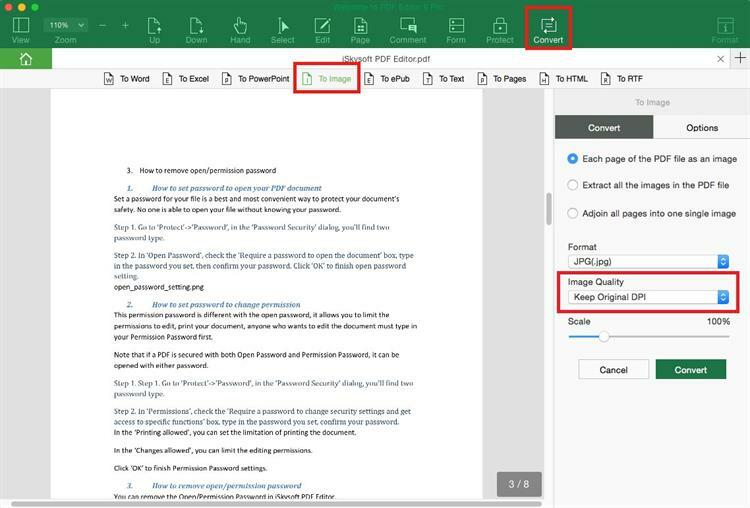 Convert PDF to PPT with Nitro Pro Not Working Fixed!